While many of the tailors covered in this series also made ladies dresses, a number of custom tailors which specialized in dresses played prominent roles in the history of the HK tailor industry. 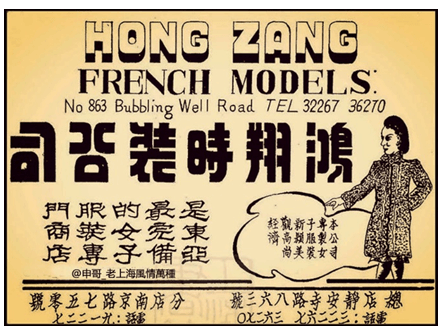 This article profiles 4 pairs of firms representing different time periods and ethnic groups – Fairall and Madame Flint which were two prominent European dress markers in the early 1900s founded by eponymous female entrepreneurs; Mow Kie and Moon Kee which were both Hakka pioneers in dress making in the 1920s-30s; Hong Zang and Laou Kai Fook which were two prominent Shanghainese brands that set up branches in HK in the 1930s and finally Johnson Tailors and Zeepha Couture, the two most successful Shanghainese dress makers after the War. Today only Zeepha remains with its third generation working in the business. Please note that this article only covers custom tailors and will not cover boutiques (e.g. Mode Elite or Paquerette in the earlier days to Joyce and Swank in more recent years)/department stores (e.g. Lane Crawford) which are purely importers of dresses or garment firms which specialize in ladies wear. Also excluded are cheongsam tailors such as Linva Fashions (founded in 1966). 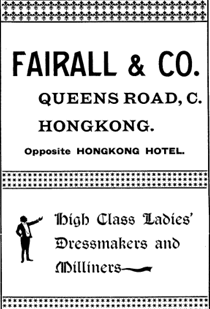 Fairall & Co was recognized as “the oldest established dressmakers and milliners in Hong Kong” in 1907 by the guidebook Seaports of the Far East. The name of its proprietress Miss Fairall first appeared in 1885’s Directory & Chronicle for China, Japan etc as a partner of Gate & Fairall, a dressmaker which operated out of the “White House” on Queen’s Road. In the 1895 Directory, she was listed as partner of Fairall & Owen, a dressmaker and milliner out of 22 Queen’s Road in partnership with a Miss Owen. By 1904, it was Fairall & Co and in 1905, it promoted an autumn show for ladies preparing for the St. Andrew’s Ball. The firm operated out of 7 & 9 Pedder Street, next to the HK Hotel. In the 1910 Directory, 7 female staff (aside from Ms. Fairall), all of European descent, was listed with Miss Parker as dressmaker and Miss Reay as milliner. In directories, the owner was simply referred to as Miss Fairall. The only Miss Fairall around that era based on records and would match the founder of Fairall & Co in terms of age is Annie Mary Fairall (1859-1937), who is buried with her husband William Thompson Shewan (1860-1926) at the HK Cemetery in Happy Valley. Fairall married Shewan, the nephew of Robert Shewan of Shewan Tomes at St John’s Cathedral on Jan 2, 1924, which means she was 65 and he was 64. No records are available about Fairall & Co after 1920 so it probably went out of business around that time. Madame Flint was one of the leading dress makers in HK from 1900 to 1920s. The firm’s founder was Marie Flint. In 1904, its address was listed as Connaught House, Mrs. E.S. Joseph (wife of a Jewish stockbroker) was listed as partner of Flint and Madame Dulot was dressmaker with two additional assistants (Ms. Simons and Ms. Mackenzie). An ad from 1909 labeled the firm as “Parisian dressmaker” and “Madame Flint goes personally to Paris every Summer to purchase her Autumn stock, and thus has up-to-date Paris fashions”. In 1917, its address was listed as 10 Des Voeux Road across from King Edward Hotel. Later in the 1920s it operated out of 37 Queen’s Road Central (now Yu To Sang Building), China Building and Pedder Building. In 1924, Madame Flint entered into partnership with Joseph Louis Durand, a Frenchman who arrived in HK in 1922 after an unsuccessful stint in Saigon leaving behind many creditors. The duo went into other lines of business (such as Café Parisien and a beauty parlor on Ice House Street) and other location (Tientsin) which ultimately bankrupted the firm in 1927. Left: Lee Mow Kie; Right: Mow Kie shop in Central (blue sign in the middle), next to India Emporium. Founded in 1926 in HK, Mow Kie Ladies Tailor & Piece Goods was one of the leading dress makers in HK and its founder Lee Mow-kie (李茂機) was recognized as a pioneer in ladies dress in Southern China. A native of Donguan where he grew up, Lee came to HK at an early age and started Mow Kie. After the War, Lee opened a branch in Canton. Lee traveled often to Europe to learn about the latest fashion trends and also to purchase clothing materials in bulk so that he could make and sell dresses at reasonable prices. 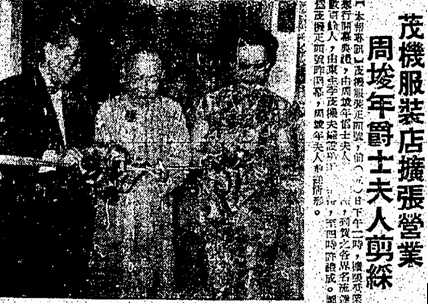 In the 1950s, the main store was located at 153 Des Voeux Road Central and a branch was established at 1 D’Aguilar Street (next to Tailor Cheung operated by fellow Hakka tailor Cheung Wood-hoi, see related article). Given the lack of competition, Mow Kie was able to accumulate a lot of wealth in the early post War years and in 1953, he completed a new building on Blue Pool Road in Happy Valley. 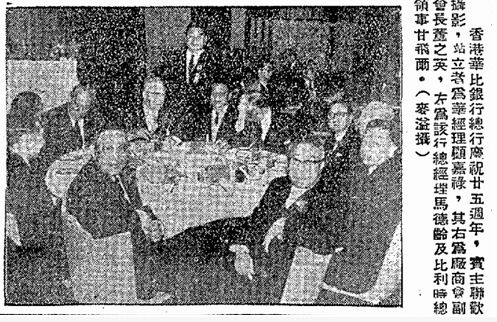 In 1959, the newly expanded and renovated main store at 1 D’Aguilar Street re-opened in a ceremony attended by the Who’s Who of HK society at the time led by Sir Tsun-Nin Chau and his wife, highlighting the stature of Lee and the firm. In 1963, a North Point branch was opened at 202 King’s Road. Outside of work, Lee Mow Kie was very active in community affairs, especially related to the Hakka community as he was one of the founding directors and vice president of the Tsung Tsin Association. He also served as a director of the Chinese General Chamber of Commerce and Tung Wah Group of Hospitals (1945-46). Mow Kie was eventually closed down as the founder aged and Lee Mow Kie died in 1989. Moon Kee was a ladies custom tailor founded in the 1930s by Hon Moon (韓滿), another Hakka tailor from Donguan. It operated out of Wellington Street in Central and counted the first wife of Cantonese opera star Sun Ma Sze-tsang (Tang Wing-cheung) and the wife of China Motor Bus founder Ngan Shing-kwan as its clients. Related to Reverend Pang Lok-sam (彭樂三), the Hakka pastor in Fanling, by marriage, Hon opened the Wo Fung Emporium at 27 Wo Fung Street at the Luen Wo Market in Fanling, the first retailer of its kind in the area in the 1950s which was popular with families of Nepalese stationed in the nearby barracks. Founded in 1916 in Shanghai by King Hong-zang (金鴻翔,1894-1969), Hong Zang was recognized as the “elite fashion house of China” during the Republican era. King started out as an apprentice in tailoring at the age of 13 and his mentor’s father was the apprentice of Chao Chun-lan (赵春兰), the first Chinese tailor of European dresses in Shanghai in the 1840s. King was one of the pioneers in making European dresses for Chinese women. With his main store at 863 Bubbling Well Road (which employed over 700 staff at its peak) and branch store at 750 Nanking Road (the two busiest shopping streets of old Shanghai), Hong Zang established a reputation as the pre-eminent maker of ladies dresses in Shanghai and the Far East. Aside from his emphasis on quality, King’s mastery of PR also contributed to the success of the firm. He staged one of the first high profile fashion shows in China featuring famous movie actresses. When the Queen of Chinese Cinema – Butterfly Wu got married in 1935, Hong Zang made her wedding gown which was stitched with a hundred butterflies. In 1947 when Princess Elizabeth of the UK (and Queen since 1952) married Prince Philip, Hong Zang sent over a Chinese dress and received a letter of appreciation from the Buckingham Palace which was prominently at its store. Hong Zang also appealed to the patriotic movement to buy Chinese goods with endorsements from leading political figures such as Madame Sun Yat-sen (who was also a satisfied client as was her sister Madame Chiang Kai-shek) and famous educator Tsai Yuanpei. As Hong Zang’s reputation spread, it built a significant mail order business with dresses being shipped not only nationwide but across the Pacific to leading stores in San Francisco, Bombay, Singapore and Manila. It is with this background that Hong Zang established a branch in Hong Kong in 146 Des Voeux Road, Central in 1937. During the Japanese occupation, King stayed in Shanghai. According to the Directory of HK, Canton and Macao in 1949, the manager of Hong Zang HK was Yang Pui. When the Communists came to power in the mainland in 1949, King Hong-zang chose to remain in Shanghai. 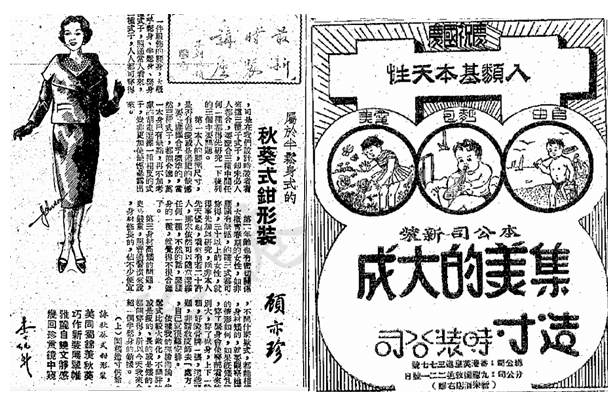 In the 1950s, it appears that Hong Zang in HK was absorbed by Kung Brothers (公興百貨), a major retailer of linens and other goods (including watches and audios) founded by Shanghainese entrepreneur and University of Shanghai graduate Kung Chia-lung (龔甲龍). In 1959, both Hong Zang and Kung Brothers set up its Kowloon branch at the new Miramar Arcade in TST. In 1975, the Des Voeux Road store of Hong Zang was still in operations and was burglarized. Since then, both Hong Zang and Kung Bros has faded into history. Left: Lo Kai Fook in HK in the 1950s on Queen’s Road Central on the left; Right: Laou Kai Fook flagship store in Shanghai in 1936. The site is now home to the Shanghai branch of Forever 21. Lo Kai Fook (also spelled Laou Kai Fook in old Shanghai) was founded in 1860 in Shanghai as the Kai Fook Silk Shop by the Chu brothers from the Fujian province. In 1935, the firm acquired the ground floor of the Hardoon Building. Its celebrity clients included Madame Wellington Koo (Oei Hui-lan) and Hollywood actress Anna May Wong. On November 2, 1939, Lo Kai Fook opened its branch in HK at 140 Queen’s Road Central where it remain for the next decades. In 1963, it was selling materials from Switzerland, UK and France with Shanghainese tailors and claimed its price was the cheapest in town. 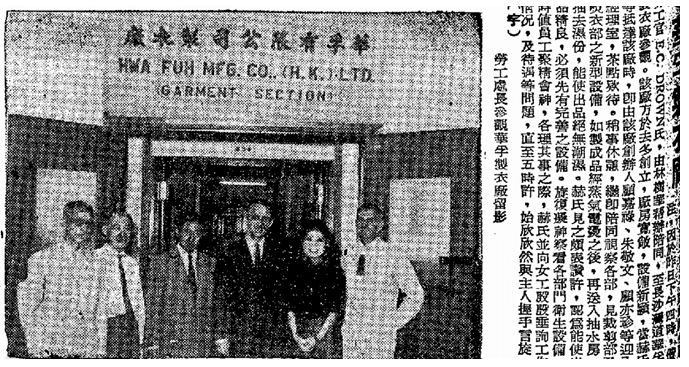 In 1965, Lo Kai Fook Silk Co was incorporated in HK. The firm was dissolved in 1996. “Laou Kai Fook :A Living Intangible Industrial/Business Heritage, Case Study of a Traditional Fabric and Tailor Shop in Shanghai” by Yijun Sun. From the 1950s to the 1970s, Johnson Tailors (whose Chinese name which sounds like Johnson means “inch by inch”) was the premier dress maker in Hong Kong. Founded in 1950 by Koo Yik-chun (顧亦珍, 1917-, refer to as “YC Koo” hereafter), one of the most successful female entrepreneurs and industrialists in HK history who came from Shanghai, Johnson’s first store in HK was located in 377 King’s Road in North Point, when the district became known as “Little Shanghai” as massive influx of refugees from Shanghai settled there. The two movie stars who were present at the opening ceremony were Bai Guang and Wang Dan-feng. There was a Johnson Tailors in old Shanghai founded in 1930 which had identical logos and names as the HK one but the connections between the two are unclear. The founder of the Johnson Tailors in Shanghai was a tailor by the name of Chang Siu-chun (張兆春), who changed his name to Johnson Chang ( 張造寸). Born in 1903, Johnson Chang was the son of a Red Gang tailor and worked for Hong Zang himself before striking out on his own, setting up shop at 296 Bubbling Well Road in Shanghai. Aside from tailoring, he was known as an amateur runner. YC Koo started her first business in Shanghai in 1937 at the age of 20 under the name of Hwa Fuh to make high quality men’s shirts which was distributed throughout China. Her father C. P. Koo (顧濟伯 1883-1978) was a prominent Chinese doctor in old Shanghai and her eldest brother C.F. Koo (顧家帆) also became a Chinese doctor. Her second eldest brother C.L. Koo (顧嘉祿), who served as the chairman of Johnson, was the Chinese manager of the Banque Belge pour l’Etranger (華比銀行, later Fortis Bank Asia and then absorbed by ICBC) in HK and moved to HK from Shanghai in 1938 with the bank. Fluent in French, CL Koo helped preserved the Bank’s assets in HK during the Japanese occupation and after the War put the Bank on the map in HK by providing credit to his fellow capitalists from Shanghai, who were one of the major driving forces in postwar HK industry and commerce. As the Civil War situation deteriorated in the mainland, Koo moved Hwa Fuh’s shirt making operations to Taiwan in 1947 and moved to HK with her husband in 1949. After its launch in HK, Johnson quickly found a following among the local elites (wealthy taitais and movie stars) and a Kowloon branch opened at 221B Nathan Road in 1953. (the Kowloon branch was later moved to 60A Nathan Road near Peninsula and Ambassador hotels) This was followed by a Wanchai branch at 2-6 Causeway Road, which was opened on September 1955. The manager in charge of the Wanchai store was L.M. Cheung (張良明). In addition to its stylish designs and high quality, Johnson’s success could be attributed to YC Koo’s marketing acumen. Koo cultivated relationships with major movie stars (domestic and international) at the time and every store opening was a major event with lines of star chasers queuing up. She organized high profile charity sales which enhanced the image of the brand. And to add to this she wrote a column about fashion in the local newspaper in the 1950s. As a result, Johnson Tailors was the top ladies fashion house in Hong Kong in the 1950s and 1960s. As for Johnson Tailors in the mainland, the firm along with 21 other tailor shops were asked by Premier Zhou Enlai to relocate to Beijing in 1959 where there was a dearth of tailors. It became a favorite for the wives of senior officials. During the Cultural Revolution the store was closed. However, by popular request, the store re-opened in 1981. Zeepha Couture is the leading dress maker in Central known for its craftsmanship. Its eponymous founder Zeepha Cheung apprenticed for a number of French tailors in the French Concession in Shanghai in the 1930s and 40s before striking out on his own in 1946 when he established Zeepha Couture at the Hong Kong Hotel in Central. The firm moved to the Prince’s Building in 1965 where it operated for 26 years. In 1991, the firm relocated to ground level at New Henry House in a ceremony attended by many local celebrities including Legco councilors So Chau Yim-ping and Selina Chow. In 2010, it relocated to its current location at Room 1401, 1 Duddell Street. The famous overseas clients of Zeepha included members of the British royal family such as Queen Mother and Princess Anne and American movie stars such as Brooke Shields. Zeepha’s son Eric Cheung (張德忠)started working for his dad at the age of 18 and took over the business in 1974 as chief designer. In recent years, Eric’s son Asa (張正年) and Athena (張秀芳) also joined the business. This article posted on 20th October 2017.